The application process for the Cirrus Sidechain Masternodes has now come to an end. A great amount of interest has been received which has resulted in a significant number of Masternodes being assigned. 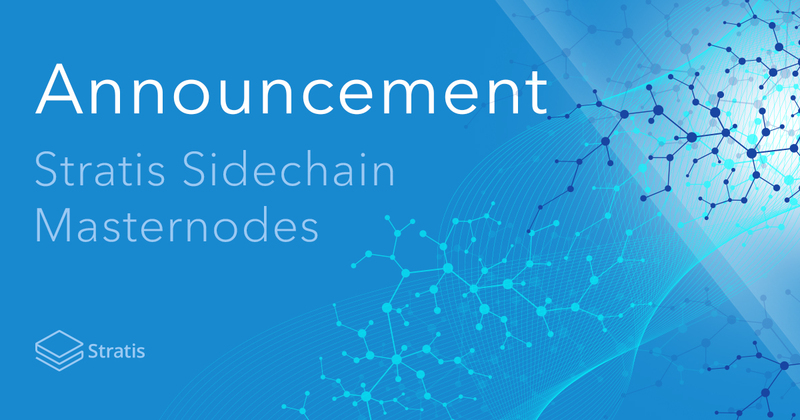 The development of the Sidechain Masternodes is also drawing to a close, making this a great opportunity to offer a lower-level explanation as to how the network will operate and also what features to expect. An important development of the Stratis Sidechains solution is the inclusion of on-chain voting. This enables dynamic management of the chain. On-chain voting can and will be further extended to cater for a wide variety of functionality on a sidechain. Currently the functionality is limited to the below. Operating a Masternode consists of running and maintaining two nodes, one for each network. These nodes are a little different from the Stratis Full Node and include additional features that allow for bi-directional communication between the respective chain nodes. To ensure consistency, we have utilized PowerShell Core to deliver a deployment script, due to the cross-platform support that PowerShell Core brings. The script will configure and launch the two nodes required for Masternode operation, requiring user intervention, ensuring that any sensitive information is not stored locally or entered into a browser. Upon the release of the Masternode’s for the Cirrus Sidechain, full documentation will be provided. Day-to-Day operation of the node can be performed via the Sidechain Dashboard. The dashboard provides an informative page detailing the Masternode’s activity and status. Allowing a Masternode operator to act upon outstanding votes on the network, increase logging for troubleshooting and display wallet balances for transaction fees obtained. As time progresses, we aim to deliver a fully functional user-interface that behaves similar to wallet, catered for the operation of a Masternode. Ensuring the security of both the Stratis Mainchain and Cirrus Sidechain whilst incentivising the operation of nodes is something that is very important for both Stratis and the operators of a Masternode. As a direct result of received feedback, we have successfully implemented an additional consensus rule that will validate the balance of a given collateral address on the Stratis Mainchain. This crucial development ensures that Masternode operators can continue to stake their collateral, inherently further securing the Stratis Mainchain whilst actively operating a Sidechain Masternode on the Sidechain. During the registration process, you would have provided a STRAT address that contained the amount of collateral required for the relevant Masternode. This address will be tied to your public key, upon the production of a block, a check will be made ensuring that the balance remains above the set collateral amount. If the balance of the provided address does not meet the collateral requirement a block will not be produced. If this continues for subsequent blocks, the public key will be removed from the Federation. If this occurs, you will have to perform a new registration on-chain, this request is then approved by the remaining Federated Members. Once 51% of existing Federated Members vote for the addition, the public key will be included in the next cycle of block production. How do I get Cirrus Tokens? The Cirrus Sidechain is a Two-Way Federated Peg, meaning that it is connected with the Stratis Mainchain. Therefore, each Cirrus Token maintains a 1:1 ratio with the Stratis Token. Along with the release of the Sidechain Masternode’s there will be an update performed to Stratis Core, this update will introduce a new tab that will enable you to transfer STRAT from the Stratis Mainchain to the Cirrus Sidechain, crediting you with 1 CRS Token per each STRAT transferred.